Innergex Renewable Energy has entered the solar power industry in a big way—with the 27 MW Stardale project in the Canadian province of Ontario—and at the same time, removed a lot of the risk. Some companies start small—notInnergex Renewable Energy. The company's first venture into the solar power business was the 27 MW Stardale solar farm in the Canadian province of Ontario. While it was under construction, it was the fourth largest solar project in North America and the 14th largest worldwide. Although Stardale is an enormous project, Innergex—already possessing a large hydro and wind power portfolio—definitely looked before it leaped. "When the deal was becoming more of a reality, we made sure that we understood every aspect of it. We turned every rock to understand the risks very well," says Jean Trudel, Innergex's chief investment officer and senior vice president-Communications. "We're a very conservative bunch. We always take a very careful approach to things, and we visited other solar power sites, manufacturers of solar panels, contractors, and owners. We studied the solar resource to predict the annual output of the panels and the kind of effects snow and other Canada-specific elements would have. We wanted to make sure that the risks were well-understood and well-mitigated in order to move forward." The Stardale project began as a project by Enfinity NV. Enfinity had power purchase agreements with the government of Ontario, but no project was underway. "At the time, they wanted to sell only one piece—one 10 megawatt out of the 27," says Trudel. "We started to discuss the 10 megawatt purchase with Enfinity, and I think they liked our approach, and in 2011 decided to offer us the full project." 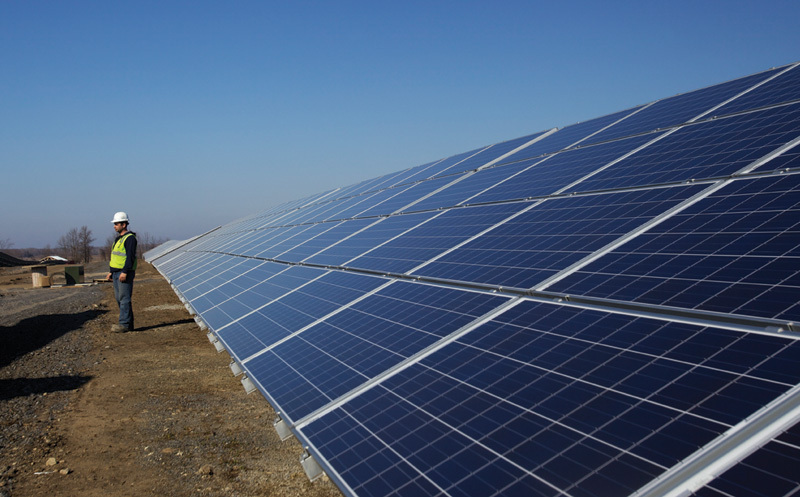 Building one of North America's largest solar farms was a significant step forward for Innergex. In April 2011, the company sealed the deal with Enfinity and kept them on as the EPC contractor. Enfinity's presence also helped reduce Innergex's risk. "We structured a deal whereby if the project didn't meet or exceed certain milestones, we would adjust the price downward or upward depending on if the project assumptions materialized or not," says Trudel. "Since it was our first solar project, we were careful. Keeping Enfinity in the loop during the construction, and then the operation, made it possible." When Innergex stepped in, permitting was complete and construction was ready to begin. Enfinity contracted Sullivan and Sons to do the construction. The company is well known in Ontario and had completed other solar projects in the area. The panels hadn't been purchased yet, but discussions were well underway. "We visited a few manufacturers, and we selected SolarWorld out of Oregon," says Trudel. "We felt they had the highest quality panels. Not only do they grow their crystals in Oregon at the manufacturing facility, they also assemble their own panels in a great manufacturing environment. It's a top quality facility, and we were very impressed." Innergex was so impressed they purchased 144,060 SolarWorld 230-watt panels with a tilted racking system. The 33+ MW of capacity required 54 Schneider Electric Xantrex 500-kilowatt inverters, which limited the output to 27 megawatts, says Trudel. "We did look at different inverters, but Enfinity had done quite a bit of work on that front, and we were at ease with the choice. Xantrex, manufactured by Schneider Electric, is one of the highest quality inverters; there was no question about it." The company feels the two parcels of land that host the solar power facility are ideal. They are close to interconnection just an hour from Montreal, the location of Innergex's home office. The location has good sun exposure, and the area doesn't experience smog, as would be the case if the project were near Toronto (Ontario's capital), Canada's largest city. "The site is also located on land where there's no real agricultural use, or not important agricultural use, so that was also very important. 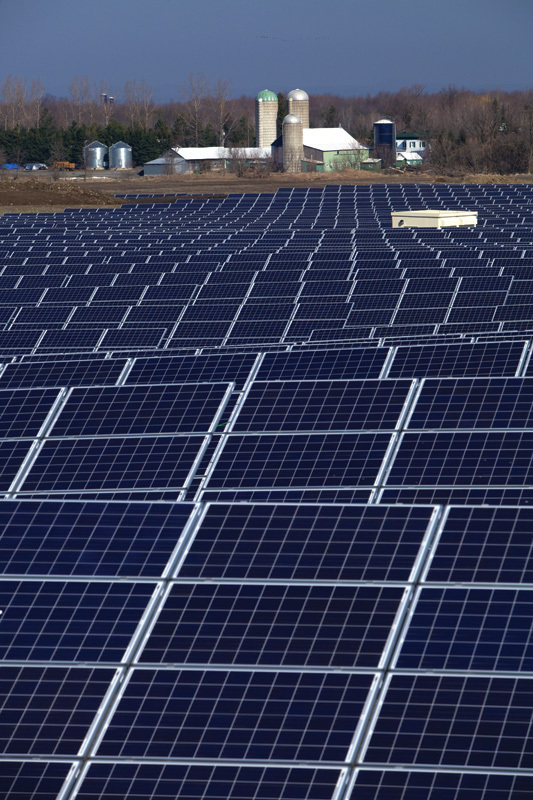 You don't want to displace good high-quality farm land to build solar assets," says Trudel. What proved to be a challenge during construction were the 12,000 foundations, which had to be dug and filled with concrete. Geotechnical analysis of the land had been done, but it was impossible to analyze all 12,000 spots. "When it was time to dig the foundations, we realized that the quality of the land was different from one area to another, and we also had to work with the water table management," explains Trudel. "We had some luck because the winter was not harsh at all, and the contractor could work longer through December and also earlier when the spring came. We caught up, pretty much, on all the delays, and eventually we put the project in service on May 16," adds Trudel. Innergex officials visited SolarWorld's facilities in Oregon and were impressed with the manufacturing and assembly process. 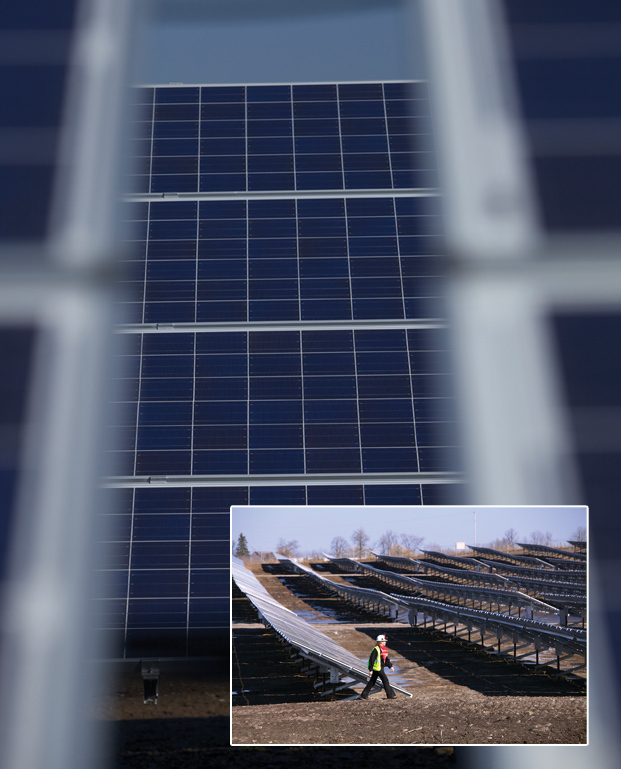 They used 144,060 SolarWorld 230-watt panels with a tilted racking system on the Stardale project in Ontario. At the peak of installation, there were around 200 construction people on site. The delays in pouring foundations required the contractor to add extra shifts and work six-day weeks; however, Innergex wasn't hurt financially by the delays. Their early focus on risk management paid off. Their contract agreement with their EPC contractor made them whole for any delay and lost revenue. There was a bright side to the delays in installing the racking system. It helped with the coordination of moving panels from Oregon to Canada. The panels were shipped by train to Ontario and stored in a warehouse. "Because we were not ready to receive them on-site and install them, they had to be stored. When the racking systems were being installed, we could just bring the panels to the site and install them right away," says Trudel. "It was an interesting logistics effort." Most solar farms are built in sunny locations, so there was some concern about putting one in snowy Ontario. Much study was done ahead of time to ensure the snow wouldn't hinder energy production. As the panels were installed over the winter, Innergex got to see firsthand that the results of their studies by various third parties were correct. Even with 8 to 9 centimeters of snow, the sun's rays can make their way through. However, when the panels start operating, it doesn't take much for them to warm up. With the panels at approximately a 25-degree tilt and a meter-and-a-half off the ground, average snowfall melts and falls to the ground with minor impact to the panels' performance. "The heat differential between the outside air and the panels is quite enough to melt any snow sitting on the panels. It only takes a few hours of morning daylight to melt the accumulated snow," says Trudel. "The main risk is not really the snow that you would get on a normal day, but a really big snow storm at night. A strong accumulation of snow at night would take longer to fall off the panel." Another weather issue that could be problematic is an ice storm, which could effect production more than snow. Luckily, ice storms are pretty rare in this area of Ontario. What Innergex is discovering is that even without being plugged in, the black glass attracts enough heat to melt the snow. "We're quite comfortable with our assumption that the snow will not be a major factor," says Trudel. The project cost approximately $140 million, and Innergex structured the financing so that the equity invested will attract an interesting return. Most solar farms are built in sunny locations, so there was some concern about putting one in Ontario, which receives a good amount of snow in the winter. But with the panels at approximately a 25-degree tilt and a meter-and-a-half off the ground, average snowfall melts and falls to the ground with minor impact to the panels' performance. The company is also moving ahead with other solar projects in Ontario. "It's the only province that offers these types (Feed-In Tariff) of contracts right now. In Ontario, we currently have about 60 megawatts of potential projects close to interconnection," says Trudel. "We are also always interested if anyone is selling an early-stage project or operating project. Right now Stardale represents about eight percent of our revenues, and we'd like to grow that segment further down the road." The company currently has approximately 2,800 megawatts of prospective projects—projects that don't yet have power purchase agreements, but RFPs for new energy will in all likelihood be issued by the provinces of either B.C., Quebec, or Ontario. "We're quite active in all three segments—hydro, wind, and solar—to increase the size of the company," says Trudel. "We've recently acquired two hydroelectric facilities in B.C. We also acquired a wind farm that's being developed in B.C. as well as another hydroelectric facility in Quebec. We also have a Letter of Intent with a private company to buy six other hydroelectric facilities, so it's a very, very busy time for Innergex right now." With the Stardale project complete, Innergex is proud of completing it under budget, even with the small delays. In addition, the solar farm was producing in July at 117 percent of the anticipated output. "The overall experience has been very positive. We've entered this new segment, we've increased our diversification from just purely hydro and wind, and improved our diversification geographically by adding another asset in Ontario," says Trudel. In terms of power generation, Trudel says, they used to say that they were only happy when it rained, which had a positive impact on their hydro power. "Then eventually it was when it was windy—and now we're happy when it's sunny too. We're covered on all fronts."